Chennai : Wedding season is going round in full swing and besides common people; the 'Band Baaja Baarat' is captivating the heart and mind of celebrities. On Monday, 11 Feb 2019, Soundarya Rajinikanth and Vishagan Vanangamudi tied the knot in The Leela Palace in Chennai. The couple exchanged marital vows in a traditional Hindu ceremony. Both the bride and groom were looking stunning and Soundarya's bridal make-up was exceptional. In the wedding, Rajinikanth's daughter Soundarya donned a gorgeous hand-embroidered pink Abu Jani and Sandeep Khosla couture saree for the muhurtham. Draped in an elegant traditional way, she paired her Kanchipuram silk saree with a backless embroidered choli. Soundarya's saree was adorned with gold floral embroidery and intricate jali and zari work. She accessorised her look with a stunning maangtika, gorgeous diamond necklaces and gold bangles. 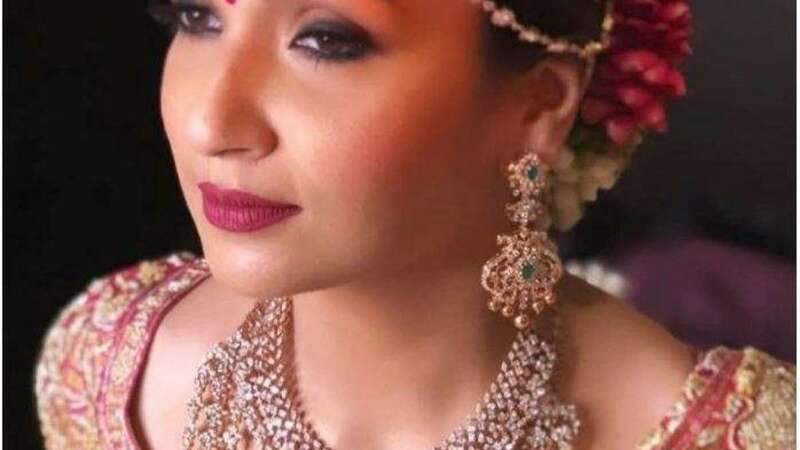 To add more, the jaw-drooping bridal look of Soundarya was completed with a traditional braid, adorned with a pretty gajra, smoked-out eyeliner, glowing face and raspberry lips. Going back to the engagement ceremony, Soundarya wore a green silk saree embroidered with bronze red border and paired with a brocade red blouse. She paired her look with a gorgeous diamond choker necklace and a gajra-styled braid. As for Vishagan Vanangamudi, he wore an off-white silk shirt and a dhoti with sky blue border and a matching angavastra in the wedding time. Other than celebrities, the grand gala was attended by Tamil Nadu Chief Minister Edappadi K Palaniswami, who blessed the couple and posed for a few photos. Photos of the newlywed couple are warming up the aura all over social media. Fans across the globe are taking the medium of Internet to wish Soundarya and Vishagan a happy married life.